The latest competition on wine-pages gives you the chance to win a £200 case of superb organic and biodynamic wines from leading specialist retailer, Vintage Roots. As always, there are no strings attached: enter the competition and the case could be yours, plus a copy of the very useful little book “Biodynamics in Wine.” What’s more, for the duration of the competition if you visit Vintage Roots website you will be offered 10% off your next order. See the competition details here. For some time now the far east has been seen as the potential pot of gold at the end of the rainbow for quality wine, as more and more of its one billion plus population discovered the joy of wine. 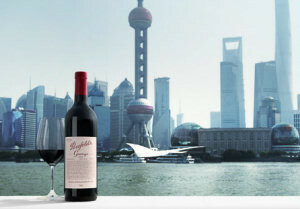 Until now growth has been largely in the ‘on-premise’ market: restaurants and bars, but new evidence from research funded by Wine Australia suggests that more and more Chinese are consuming wine at home, in less formal situations.The three-year study has found the number of people buying imported wine in China and their frequency of consumption is on the rise. Whilst Australian wine exports jumped 14% overall in 2015, the strongest growth of all was in China, which grew 66% to $370 million. Caspar and Victoria Bowes, founders of the online wine auction site GrapePip, were announced as this year’s recipients of The Vintners’ Benevolent Award for their outstanding commitment to supporting the charity and raising vital funds for their colleagues in need. 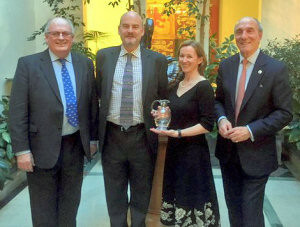 The award was presented at The Vintners’ Annual Wine Trade Lunch in aid of The Benevolent in January. Caspar and Victoria raised £10,000 via their ‘Lots for Charity’ category on their interactive wine auction website GrapePip, where sellers were strongly encouraged to donate. Caspar Bowes said “We were absolutely delighted to win this award. We continue to auction wines for charitable causes via our Lots for Charity channel and hope that members of the wine trade will use it on an ongoing basis to clear unwanted stocks for a good cause, and designate The Benevolent as the beneficiary.” Caspar and Victoria centre of picture flanked by Simon Leschallas (master of the Vintners) and Chief Executive David Cox. It is said to have been invented when a road race once hurtled through the streets of Reims in France, and the sight of an F1 winnner spraying Champagne over the podium is as much a part of motor racing history as the smell of high octaine fuel. But after 15 years the winners will not be spraying Champagne Mumm in 2016. The brand’s owner, Pernod Ricard, are reported as saying their latest €5 million sponsorship offer was deemed “insufficient.” Instead, Moët et Chandon will be presented during the trophy ceremony. I’m sure you did not miss the news last month that new government guidelines on alcohol consumption have drastically reduced the previous NHS guidance, published in 1995, advising that men should drink no more than 21 units of alcohol per week. The new guidelines have lowered that to 14 units, the same level as women. The report concluded that any amount of drinking increases the risk of a range of cancers. The report also questioned the widely accepted health benefits of drinking red wine because of its antioxidant efffect. However Brigid Simmonds, chief executive of the British Beer and Pub Association, criticised the guidelines saying that a limit of 14 units per week for men (about seven small glasses of wine) is well out of line with other countries including the US (24.5 units), France (26 units), Italy (31.5 units) and Spain (35 units).